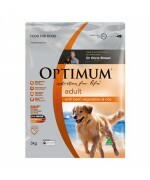 Optimum Beef Vegetables And Rice Adult Dog Food contains glucosamine which provides the natural building blocks for cartilage to help maintain joint health. 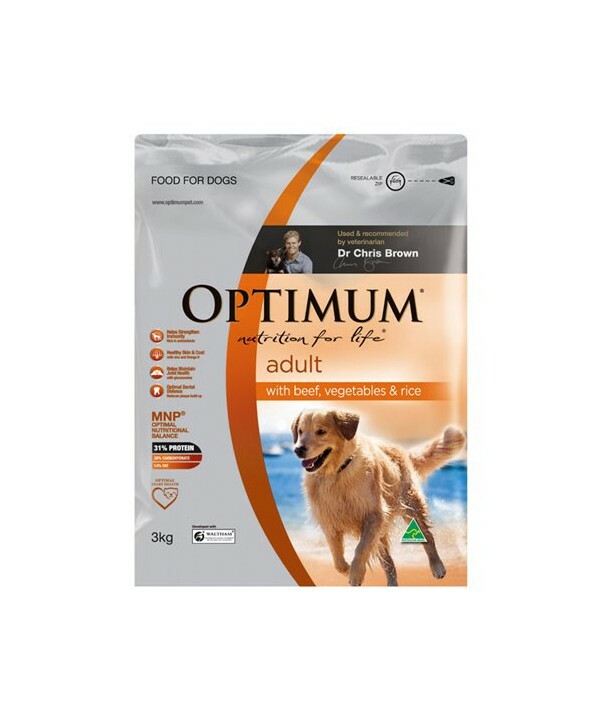 Optimum dog food range include a specially developed formulation with arginine, taurine and vitamin E that assists in keeping the heart and blood vessels healthy. A unique blend of antioxidants including vitamin E & C help strengthen the immune system, and keep your dog healthy by helping to reduce the oxidative stress on your dog's cells. Health digestion is promoted by the inclusion of a natural prebiotic, inulin, selectively promotes the growth of beneficial bacteria in the gut resulting in fewer and firmer stools. Additionally, beet pulp fibre helps to control intestinal transit and to maximise nutrient absorption. The formulation also contain zinc & omega 6 for healthier skin and coat and sodium tripolyphosphate to promotes good oral hygiene for your dog. Made with real meat, this provides a nutritionally complete and balanced meal that your dog will enjoy everyday.